Scientists have discovered a vast plume of iron and other micronutrients more than 1,000 km long billowing from hydrothermal vents in the South Atlantic Ocean. The finding, published online Aug. 18 in the journal Nature Geoscience, calls past estimates of iron abundances into question, and may challenge researchers’ assumptions about iron sources in the world’s seas. “This study and other studies like it are going to force the scientific community to reevaluate how much iron is really being contributed by hydrothermal vents and to increase those estimates, and that has implications for not only iron geochemistry but a number of other disciplines as well,” says Mak Saito, a WHOI associate scientist and lead author of the study. Saito and his team of collaborators—which includes WHOI researchers and a colleague affiliated with the University of Liverpool (U.K.)—didn’t set out to find iron plumes in the South Atlantic. 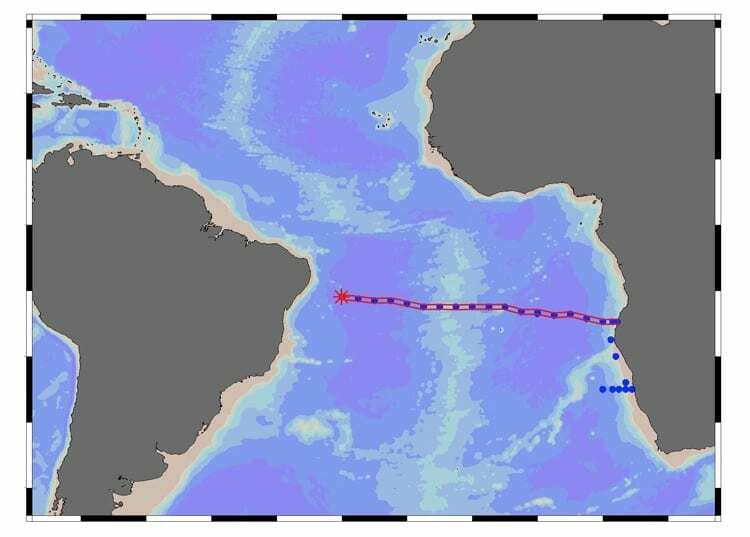 They set sail aboard the R/V Knorr in 2007 as part of the Cobalt, Iron and Micro-organisms from the Upwelling zone to the Gyre (or CoFeMUG, pronounced “coffee mug”) expedition, which intended to map chemical composition and microbial life along the ship’s route between Brazil and Namibia. 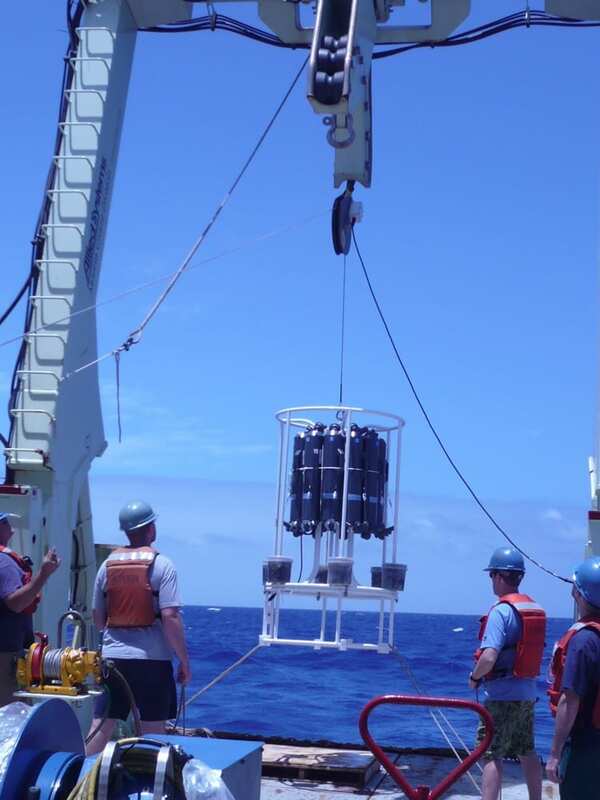 As the scientists traveled the route, they sampled the seawater at frequent intervals and multiple depths along the way, and then stored the samples for in-depth analysis back on land. Their route passed over the Mid-Atlantic Ridge, a band of mountains and valleys running along the Atlantic Ocean floor from the Arctic to the Antarctic where several of the Earth’s major tectonic plates are slowly spreading apart. Hydrothermal vents, or fissures in the Earth’s crust, are found along the ridge, but they haven’t been extensively studied because slow-spreading ridges are thought to be less active than fast-spreading ones. Past studies using helium, which is released from the Earth’s mantle through hydrothermal vents and is routinely used as an indicator of vent activity, have found little coming from mid-Atlantic vents, and researchers have assumed that means the vents spew little iron as well. So Saito and his colleagues were surprised by what their samples revealed when later studied in the lab. Once filtered and analyzed, some of the seawater showed unexpectedly high levels of iron and manganese. When Abigail Noble, then a WHOI graduate student, and Saito plotted the sites where the iron-rich samples were taken, they realized the samples formed a distinct plume—a cloud of nutrients ranging in depth from 1,500 to 3,500 meters that spanned more than 1,000 km of the South Atlantic Ocean. The plume’s ratio of iron to helium was 80-fold higher than ratios reported for faster-spreading ridges in the southeastern Pacific Ocean. The serendipitous discovery casts doubt on the assumption that slow-spreading ridges are iron-poor, and it raises questions about the use of helium as an indicator for iron flux in hydrothermal vents, Saito says. And that has profound implications, because iron is a critical element for ocean life. Iron is known to spur the growth of phytoplankton in many marine habitats, especially those important in the ocean’s carbon cycle, which, in turn, impacts atmospheric carbon dioxide levels and Earth’s climate. Because more than half the world’s seafloor ridges are slow-spreading, the team’s discovery suggests there may be far more iron from these locations than previously estimated. “We need to understand where iron is in the ocean and where it’s coming from to understand the role of iron in the marine carbon cycle with any confidence,” Saito says. Saito and his colleagues hope future studies will reveal the exact shape and extent of the plume, and just how much of its iron and other micronutrients persist and rise to the surface. Answering these lingering questions will help researchers truly understand how hydrothermal vents affect the ocean as a whole, Saito says. The research was supported by the U.S. NSF-Chemical Oceanography program and the Gordon and Betty Moore Foundation (grant GBMF2724). 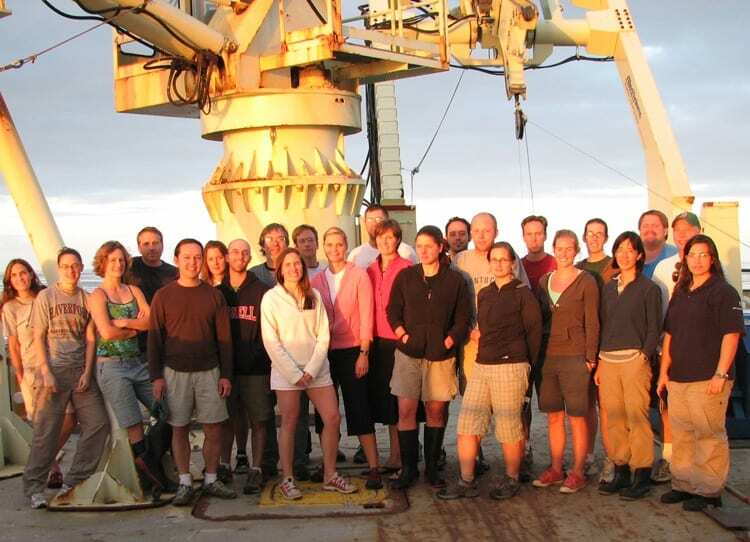 Scientists traveled from Brazil to Namibia aboard the research vessel Knorr, which is owned by the U.S. Navy and operated by WHOI for the ocean research community, to gather data for the CoFeMUG expedition in 2007. The expedition aimed to map ocean chemistry and microbial life along the ship’s route. Aboard the R/V Knorr, WHOI researchers Carl Lamborg, Tyler Goepfert, and Chad Hammerschmidt deploy a trace metal rosette on five kilometers of non-metallic line to gather samples of seawater from the depths of the South Atlantic Ocean. Former WHOI graduate student Abigail Noble, now a postdoctoral researcher at the Massachusetts Institute of Technology, examined the samples Saito and his colleagues collected aboard the R/V Knorr. 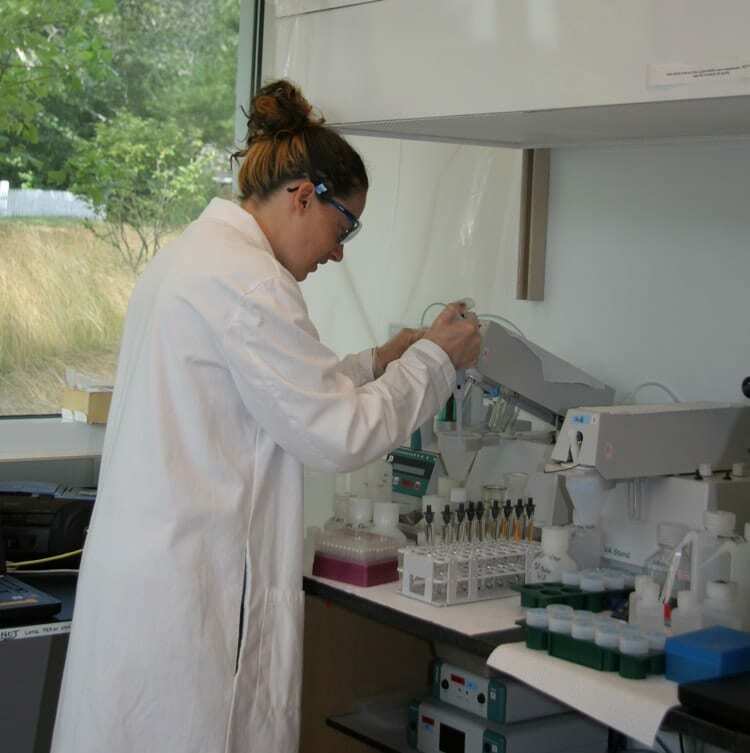 Her trace metal analyses revealed the presence of a plume of dissolved iron and manganese billowing from the Southern Mid-Atlantic Ridge.